The old maxim goes: never talk politics or religion in polite company. It’s taken numerous forms over the years, but that’s the general gist. And it’s solid advice. People feel passionate about these topics and conversations often become heated. Friendships have ended for less. But in increasingly divided times, it’s important to think about how politics and divorce intersect. It’s one thing if friends or coworkers have drastically different political beliefs. This can lead to difficult interactions in social situations or at your job. That’s hard enough to handle. But it’s something else when it’s your spouse. You can avoid dicey topics at work, after all, you have work to talk about. It’s also easier to skirt politically treacherous subjects with friends you don’t see every day. There are kids, jobs, sports, and many other topics to discuss. But you probably spend exponentially more time with your spouse than with anyone else. It’s much more difficult, and exhausting, to constantly tiptoe around hazardous territory. In reality, politics and political leanings often have a huge impact on the stability of relationships and marriages. Ongoing political disagreements often lead to divorce. And it’s only getting worse. 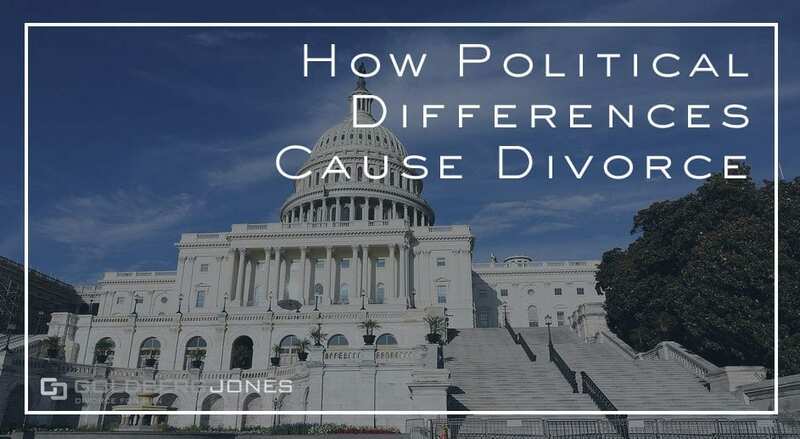 With divisive political figures, most notably Donald Trump, and contentious issues cropping up on a regular basis, it’s increasingly common to see cases where politics cause divorce. Popularized as “The Trump Effect,” the 45th and current President of the United States has had a significant impact on divorce and relationships. Less than a year into his first term, Donald Trump has changed immigration, education, health care, and more. His presence in the Oval Office has also had a substantial impact on personal relationships. Friendships have ended, families are at odds, and marriages have come to an end, all because of individual feelings toward the POTUS. While McCormick’s case is the most well known, she’s nowhere near the only one to react this way. In December 2016, a poll of 6000 people found that 16% of those who responded stopped talking to a friend or family member as a direct result of the election. 17% also said they blocked friends or family on social media for the same reasons. Wakefield Research, a marketing firm, also conducted a similar survey. Their in-depth study of 1000 “nationally representative U.S. adults” found comparable results. The collected data indicates that 11% of Americans, more than one in ten, have ended relationships over political differences. For younger generations, this number climbs steeply. According to the responses, 22% of Millennials, more than one-fifth, have ended a romantic relationship because of political strife. In recent days, many of these political disagreements stem from Trump and his policies. Even if their own relationship remains unaffected by political disagreements, many people have witnessed the toll it takes. 22% of people in the Wakefield survey know someone “whose marriage or relationship has been negatively impacted specifically do to President Trump’s election.” Again, this number skyrockets for younger people. The number spikes to 35% for Millennials. Politics and divorce often go hand in hand. Such disputes have always been a huge source of shattered marriages. That’s unlikely to change anytime soon. But what can you do if you and your spouse fall on opposite ends of the political spectrum? Such conflict can kill relationships and lead to divorce. Can is the key word. But just because such differences often do cause conflict that ends marriages, that doesn’t mean they will. Every situation involves different people and no two play out exactly the same. If you and your spouse have political disagreements, whether that leads to divorce depends on you. Some couples are able to work around opposing views. It may take time and effort, or even steps like counseling, but it is possible. One approach is to focus on the values you share instead of those you don’t. People from all walks of life, backgrounds, and political parties marry and live happy lives. It happens all the time. But even if a couple can find a temporary solution, that may not be the best base for a successful marriage. Pretending a disagreement doesn’t exist isn’t a great strategy. Ignoring a problem doesn’t make it go away. It may work in the short-term, but it can lurk under the surface and cause unseen, unacknowledged tension. In the end, burying it may only lead to a bigger fight down the road. At some point, if you can’t find a way to comfortably live together, you may need to reexamine your marriage. Some differences are simply too profound, too fundamental to get past. No matter how much you care about one another, you may need to take a long, hard look at your situation and give it an honest evaluation. Can you continue to live with and love a person you disagree with on a basic, deep-down level? Only you can answer that question for yourself, but it’s one you need to figure out eventually. At some point, the detriments start to outweigh the benefits and it’s important to determine what you need and what’s in your best interest.